The Task Force on Environmental Health 2016-2017: analysis of its report and, in the side bar, see its recommendations. The words of sufferers: what it’s like to seek care for severe chemical sensitivity, or other health problems when you have severe chemical sensitivity. These voices come from a ground breaking community consultation and qualitative study done in Ontario in 2012, included in Sections 3 and 4 of Recognition, inclusion and equity – The time is now: Perspectives of Ontarians living with ES/MCS, ME/CFS and FM (Varda Burstyn and MEAO, 2013). 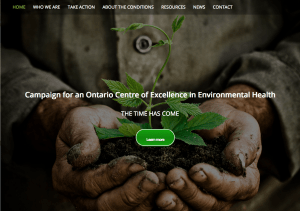 If you’ve landed on this page to learn more about the Ontario process, but don’t think you know much about chemical sensitivity, why not start on the Chemical sensitivity page? Click here to get you there. At first as a trickle in the late 1940s, then as a small stream in the 1950s, then as a river, growing faster and broader into the 1970s and 1980s, the number of people who began to present to doctors with severe chemical sensitivity – so severe that it was causing great physical suffering and forcing them into extreme isolation – grew and grew and grew. Today, we know of nearly a million people living with the condition in Canada, which makes this one of the largest groups of severely and chronically ill people in the country. But aside from one diagnosing and treating clinic near Halifax, and one diagnosis-only clinic in Toronto, there are no physicians or facilities to provide basic health care to this huge group of people within our public health care system. There has, however, been an official recognition of the disabling aspects of severe chemical sensitivity, medically and legally reflected in policy for the Canadian Human Rights Commission, many provincial human rights programs, and very explicitly in Ontario. With this comes a theoretical conferral of basic human rights as defined under Canada’s Charter of Rights and Freedoms, and disability rights within that framework. The problem is that when no-one – including employers, schools, worker’s compensation boards and even human rights commission mediators and court judges – know about a condition, it is nearly impossible to get equal treatment before the law — any law. In fact, so massive is the gap in medical, health, social and legal services where chemical sensitivity is concerned that it puts into question the notion that Canadians truly have a universal health care system. We had one once, perhaps. But it stayed stuck in a time warp and never made it into the 21st century, to deal with new forms of sickness caused by 70 years of living with a massive proliferation of new chemicals. 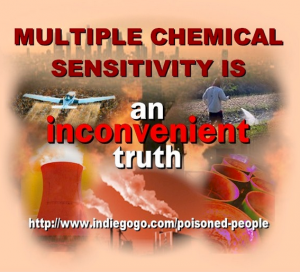 In the sidebar you can find the testimony of patients who have struggled to live with severe chemical sensitivity here in Ontario. You can read about their many negative experiences; but, important, you can also read about how positive experiences were with trained physicians. Family doctors are the gatekeepers to the rest of the system. 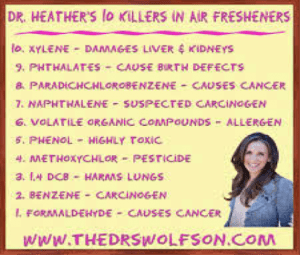 Yet there is no training for physicians in chemical sensitivity and there are no dedicated doctor’s offices that are safe for the chemically sensitive. So going to the doctor can make you more sick than before you went; many people stop going. Going to a hospital is even worse. Going to a hospital can kill you. Even completely disabled sufferers can’t get appropriate supports in daily life, supports accessed by all others with recognized disabilities. Family physicians are supposed to help coordinate and navigate care through a complex system of specialists on the one hand, and social supports on the other. But few do. Some family teams have social workers for this function, critical to peole who are often cognitively impaired and unable to easily communicate. But many of these folks are also ignorant and incapable. Though having a safe breathing envelope is considered the absolute, rock-bottom precondition to stabilization and improvement – which means that a safe home is really a medical device, not just shelter from the storm – there is no recognition of this in any place in Ontario: not in medical practice, or social housing, or medical modifications to homes tax exemptions. And this makes the very act of finding shelter a complete nightmare for a great many people who live with chemical sensitivity. This truly egregious situation of a void in care and support across the continuum of care and across systems is not for lack of trying by people with this condition. To read the history of their efforts in the province where I live (for Americans, health care is a provincial responsibility here); and to learn about the absolute refusal of successive Liberal governments in Ontario to this date (fall 2017) to implement recommendations of investigative commissions and studies, you can read my Déjà vu All Over Again It will also provide you with an analysis of the first report from the ongoing Task Force in Environmental Health, released in late September of this year. More discussion of the task force, and the major study that preceded it, follows. 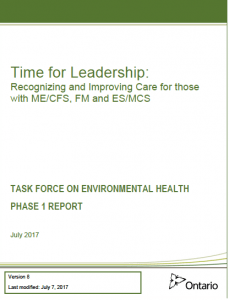 In late September 2017, Ontario’s Ministry of Health and Long term Care released the Phase 1 Report of the Task Force on Environmental Health. This task force was created to make recommendations with respect to meeting the health needs of three groups of people whose diagnoses are excluded at this time from care and support: Environmental Sensitivities/Multiple Chemical Sensitivity (ES/MCS) – a condition of toxic injury. Such people often have the “co-morbid” (co-occurring) conditions of Myalgic Encephalomyelitis/Chronic Fatigue Syndrome (ME/CFS) and Fibromyalgia (FM), recommendations for which the Task Force also has responsibility. It bears repeating many times that the number of people in Ontario diagnosed with MCS tops 250,000 and with all three conditions combined, exceeds 550,000, far out-numbering those with HIV-AIDS or MS, for example, and nine times as numerous as those with Alzehimer’s. The task force – a step in a process whose latest stage began in 2009 and has had numerous phases – began its work in June of 2016, and was given a three-year mandate. Another report is expected after the next provincial election, in 2019. The first is “Varda’s quick take” on the task force’s 2017 recommendations. The second is “Déjà Vu All Over Again – history, analysis and context, and the real challenges ahead, showing where the Phase 1 Report stands along a 32-year trend line of government neglect and broken promises. The third is a compilation of the recommendations from three seperate and distinct high level Ontario study processes on care and support for people with chemical sensitivity – MCS RECOMMENDATIONS, ONTARIO, 2017, 2013, 1985. Note: this task force is the 3rd government effort funded and tasked in the last 32 years – first in 1985, then in 2013 and again in 2016. 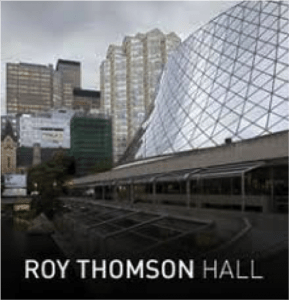 Roy Thompson Hall has adopted a fragrance free policy to accommodate people who are chemically sensitive, showing leadership and a desire for all to “share the air,” thanks to an initiative taken by an MCS activist and their enlightened response. Now that millions of people have become scent-sensitive, policies such as these are the only way to enable large numbers of people to live, work and play together. The task force should be addressing issues such as these. 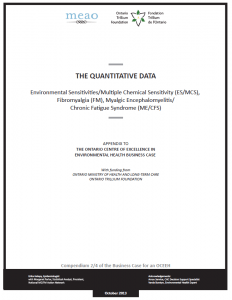 To learn what was contained in the 2013 reports for that “Ontario Centre of Excellence in Environmental Health” – a proposed network of sites to deliver a comprehensive, systems-based, and likely-to-succeed set of solutions – you can peruse the documents submitted by the Steering Committee for that project in 2013. These proposals are what many patient and provider advocates, including on the current task force, are still striving to have adopted, because these are the solutions that are truly needed. 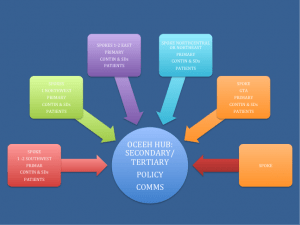 The OCEEH ‘hub and spoke’ model of care delivery – achieving recognition, inclusion and equity. The proposal for the Ontario Centre of Excellence in Environmental Health was for a network of both specialized and primary care facilities and services – a ‘system within a system’ to house, integrate and build capacity. Chronic, Complex Conditions: Academic and Clinical Perspectives, John Molot, MD, FRCFP, 2013. The clinical appendix to the business case package, this document presented the then current thinking by physicians and researchers, and recommendations for clinical services. This website is an educational project and resource developed by Varda Burstyn about chemicals & health. Unfortunately at this time, Varda is not able to provide advice to individuals on diagnosis, treatment & treating professionals, and/or legal matters. We thank you in your understanding and discretion on this and hope the materials on this site will better answer your questions and direct you to the professional organizations & persons who can help if needed. It may be helpful to know that, with a couple of other senior colleagues, in 2008 I was the initiator, then eventually the lead overall project consultant of what turned into a multi-year, multi-stakeholder study process. By 2012, that process included significant funding from the health ministry for the collaborative of stakeholders that had developed and included the Association of Ontario Health Centres to establish an “Ontario Centre of Excellence in Environmental Health” (OCEEH for short). This two-year process produced a number of important documents that addressed system problems, and, in my view, set the bar for what is required to achieve recognition, inclusion and equity for the chemically sensitive. There was a long, unjustified interregnum between November 2013 and June 2016, addressed in my Déjà Vu piece. And then the current Task Force was established. I was a member of the task force until February 2017, when I resigned. “Every single one of these recommendations is urgent and important. Indeed, taken together, they are analogous to the life-saving oxygen that paramedics administer when called to rescue and keep alive a very badly injured patient for a few moments, until more extensive – and adequate – help can be administered. The Hon. Dr. Eric Hoskins, Ontario’s minister of health and long term care, should therefore receive overwhelming messages to get that oxygen to the patient without the delay of days, let alone months or years, to keep the patient alive. And the task force should certainly be approved for telling him to do it. “However, the patient has suffered terminal injury to every single organ system – to keep the analogy going – and only comprehensive, intensive care on all fronts – which is to say at all points along the normal continuum of care – will keep that patient alive for any length of time, and eventually heal the patient. So a few emergency measures, though critical now, will mean nothing if the full menu of needed acute care is not provided in a very timely fashion. Recommendation #1. 1 Make a formal public statement recognizing ME/CFS, FM and ES/MCS: The task force recommends the Minister of Health and Long-Term Care make a statement recognizing ME/CFS, FM and ES/MCS. The statement should reinforce the serious debilitating nature of these conditions and dispel the misperception that they are psychological. It should also include a commitment to improve care and education, develop a system of care for people living with ME/CFS, FM and ES/MCS, and provide support for caregivers. The task force recommends that the Ministry of Health and Long-Term Care (ministry) fund academic chair positions in clinical environmental health focused specifically on ME/CFS, FM and ES/MCS. The chairs should be located at three different academic health science centres across the province. A key criterion in selecting/awarding these chairs should be a demonstrated commitment to champion improved care for those affected by these conditions. The task force recommends that the ministry re-initiate the process to modernize the Ontario Health Insurance program (OHIP) fee code K037 in collaboration with physician and patient experts to ensure it recognizes all three conditions. Recommendation #2.1 Develop clinical case definitions and clinical practice guidelines to support standardized, high-quality, patient-centred care. The task force recommends that the ministry establish an expert panel to reach consensus on clinical case definitions and clinical practice guidelines for each of the three conditions. The expert panel, which should include people with lived experience as well as input from expert advisors outside Ontario, should meet periodically to review updates in the science on each condition, evaluate the evidence and assess progress in managing the three conditions. Recommendation #3.1 Establish detailed clinical care pathways to support the development of an evidence-based system of care. The task force recommends that the ministry provide funds to support the development of clinical care pathways for people with ME/CFS, FM and ES/MCS and map out an appropriate patient-centred system of care for Ontario. The task force recommends that the ministry work with its partners and with expert patients, caregivers and physicians to ensure hospitals comply, as quickly as possible, with relevant accessibility and accommodation legislation. As a starting point, the ministry should work with the Ontario Hospitals Association (OHA) to build on relevant prior work, including the Quinte Healthcare Corporation policy on Multiple Chemical Sensitivities and the guidance for hospital staff contained in Marshall, LM, Maclennan JG. Environmental health in hospital: A practical guide for hospital staff. Part I Pollution prevention, Part II Environment-sensitive care (2001). Recommendation #3.3 Make long-term care homes safe for people with ME/CFS, FM and ES/MCS. The task force recommends that the ministry work with its partners and with expert patients, caregivers and physicians to ensure long-term care homes comply, as quickly as possible, with relevant accessibility and accommodation legislation. The MOHLTC should work with long-term care provider associations to build on opportunities within the long-term care home renewal process to improve accessibility and accommodation in existing homes and in the homes of the future. Recommendation #4.1: Continue to fund the Enhanced Skills Program for 3rd Year Residents in Clinical Environmental Health. The task force recommends that the ministry continue to fund this program until the task force makes further recommendations for advanced education specializing in ME/CFS, FM and ES/MCS. The Good, the bad and the ugly: positive and negative experiences with health care in Ontario. There is no publicly supported treatment for the chemically sensitive in Ontario, and participants in our study reported depressingly negative experiences with many family doctors and specialists. For many it took years, even decades, to get accurate diagnoses, though even then, this did not open the door to appropriate care. The first group of quotes below reflects this negative experience. On the other hand, when sufferers were able to access competent diagnosis and care, usually privately, the postive difference made to their quality of life, and for many, to their productivity was colossal. Investment in good diagnosis pays off; in good care, even more. The takeaway of the qualitative research we did: knowledgeable, compassionate physicians who provide competent, appropriate care help people with chemical sensitivity greatly, in every way. And incompetent, uncaring and even contemptuous physicians providing inappropriate care in unsafe facilities actually do harm to those with chemical sensitivity. At the time of this writing, nothing has changed in Ontario since the 2013 study was done. This current state represents a public wrong and a derogation by government of its duty to care. This is how all the participants in the 2012 Ontario study saw what was happening, equating their realities to negligence and abuse. If we, as citizens, want our governments to wake up to the many serious adverse health effects of our contemporary chemical regime; if we want them to enact policies and initiatives to really reverse course, from prevention of harm all the way to treating those who suffer the consequences, then acknowledging the existence of the chemically sensitive as victims of toxic injury and crafting public health and environmental regulation, legislation and on-the-ground facilities to assist them and use there well-being as a marker for health environments – just as we once used canaries for that purpose – well, that would be a great place to start.